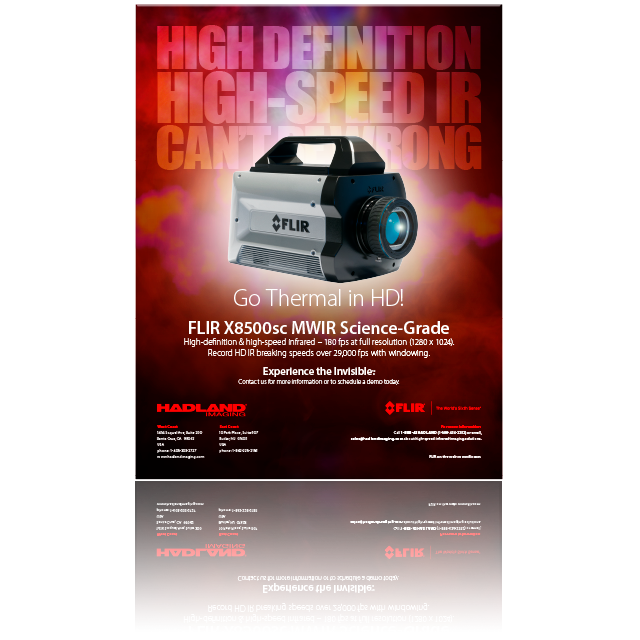 FLIR MWIR Science-Grade X6900sc & X8500sc HD video cameras. Go thermal with the fastest full resolution MWIR camera. Extraordinary high-speed infrared with over 1,000 fps at full resolution (640 x 512). 3x faster minimum gating & 2x the horizontal resolution of the nearest competition. Over 3,400 fps at 640 x 140. 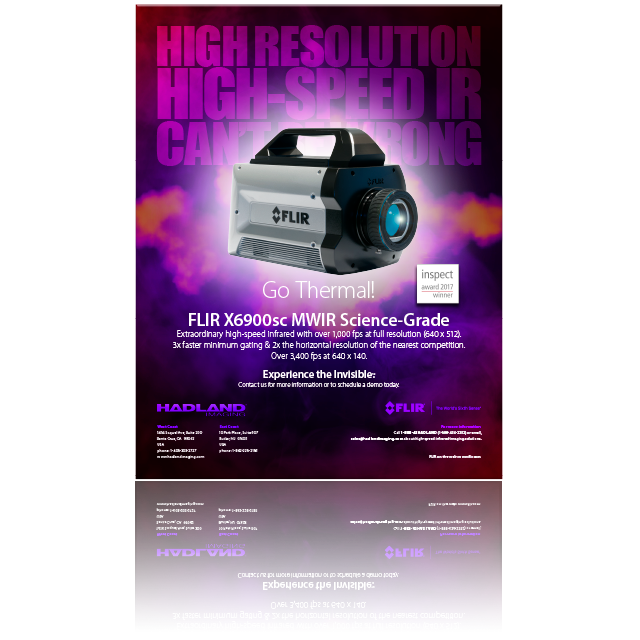 The FLIR X6900sc is an extraordinarily fast, highly sensitive MWIR (mid wave-length infrared) camera designed for scientists, researchers, and engineers. With advanced triggering, on-camera RAM/SSD recording, and a four-position motorized filter wheel, this camera offers the functionality to stop motion on high-speed events, whether they’re in the lab or on the test range. The X6900sc captures full 640 x 512 images at 1,004 frames per second, making it the world’s fastest full resolution, commercially-available thermal imaging camera. Go thermal with true HD high-speed IR imaging. High-definition, high-speed infrared with 180 fps at full resolution (1280 x 1024). Record HD IR breaking speeds over 29,000 fps with windowing. The FLIR X8500sc is a highly sensitive, high-speed, high-definition MWIR (mid wave-length infrared) camera designed for scientists, researchers, and engineers. It can record 180 fps at a full 1280 x 1024 pixel resolution, for true HD high speed thermal imaging. Windowing allows even faster frame rates of up to 29,134 Hz. The X8500sc has all the features needed for research & science: from on-camera RAM/SSD recording to a four-position motorized filter wheel. Plus, by combining HD resolution with high-speed frame rates, researchers can fully image the scene and stop motion on high-speed events – whether they’re in the lab or on the test range. Press the button already or call 1-888-43HADLAND (1-888-434-2352) to get your FLIR MWIR (or at least find out more information). I want my FLIR MWIR!